Want to see how much fun people have when they participate in Saturday Snapshot? Head on over to At Home With Books where you'll not only find links to all the other participants, you'll find the easy rules so you can join in, too! Last week many of you seemed to enjoy the photo of my fishing egret, so I thought I'd share with you another shot I got of the same egret doing a bit of aerial fishing. Was the egret successful? Yes, it was, but my camera battery died, and I didn't get a picture of its catch! Click to view in a larger size. Love the photo! Birds are amazing! Oh, that's a wonderful photo. I can smell the air. Wonderful pic. I love the reflection. Looks like he sees a fish? Great shot. It's certainly trying to scare one up, and he was successful. I love the reflection! 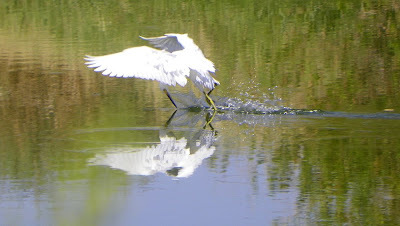 My photo today is a bird trying for a fish too but in a totally different way. I'll definitely have to come take a look! Cathy - Wow! That egret is gorgeous. You got such strength in the 'photo, too! Thanks for sharing it. My Saturday Snapshot is in the link below. I'm glad you like it, Elizabeth! My parents have egrets on their lake in Florida - they are gorgeous! Lovely shot. So many of us seem to enjoy photographing birds. Thanks for sharing. Great photo. I am not good at action shots. I don't have a very good camera. That should be on my to-do list. GET A BETTER CAMERA! You always have wonderful photos. Too bad about the camera battery, but this is still an interesting picture. Does egret get tired of fishing? Oh, I bet that was so much fun to watch! Great photo. It reminds me of one of my favourite bird videos! So funny I still laugh at it every time. Daytime! Nighttime! Great video-- thanks for leaving me the link! I love nature in motion shots--such an elegant looking bird! It certainly is. I wish I looked that good when I go fishing!